My first complete audiobook "read." 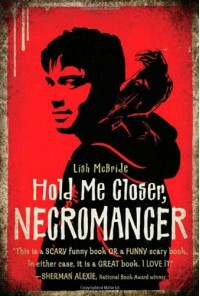 [b:Hold Me Closer, Necromancer|8041873|Hold Me Closer, Necromancer (Necromancer, #1)|Lish McBride|http://d.gr-assets.com/books/1312050504s/8041873.jpg|12671757] was a humor-filled urban fantasy romp with touching moments mixed in. A great choice for YA readers who like older, college-aged protagonists and also a great choice for male readers.